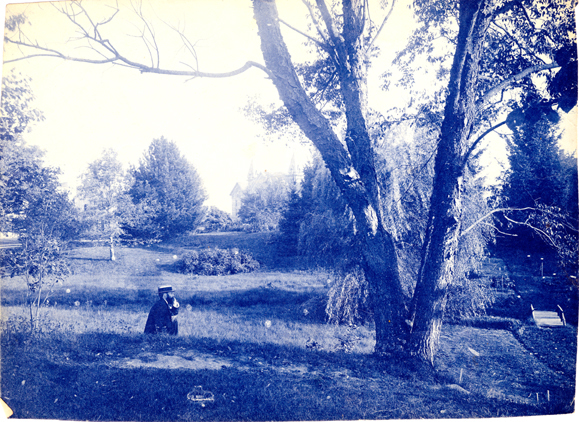 This photograph shows Dr. Beal sitting in his “Wild Garden,” before planting had begun. 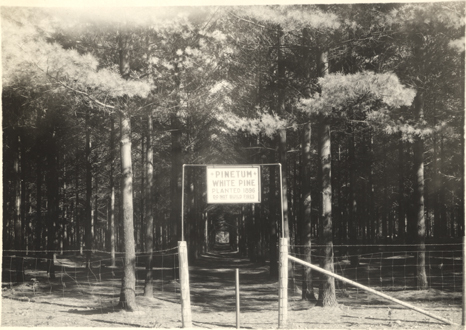 “The Pinetum” is one of the many natural areas set aside during Beal’s time that still exists today. Creating and maintaining a beautiful campus became a goal for the school. Within four years of Monroe’s statement, students had planted 2,000 trees on campus. Ten years after that, Dr.’s Robert Kedzie and William Beal began work not just on campus, but throughout Michigan to replenish the many pine forests removed earlier in the century. They began the process of acquiring land across Michigan, which today reaches 17,000 acres, for the purpose of preservation and study, and they set aside over 200 acres on the school grounds to maintain as natural areas. In 1873, Dr. William J. Beal created his most impressive specimen on campus: what was affectionately known as his “Wild Garden,” later renamed the Beal Botanical Garden. As of today, the garden is the oldest of its kind in the United States, and it holds over 5,000 species and varieties of plants. Beal built a structure for botany on campus that has gotten MSU national recognition, even being ranked in America’s 25 Most Aesthetic Campuses in 1992 by Thomas Gaines. He created small arboretums across campus that miraculously still stand today, he made what is thought to be one of the first tree and plant labeling programs in the country – which is now the most extensive in America, he established a laboratory and collection for a botanic museum, and he pioneered research into multiple areas of botanical study. In addition, as early as 1873, he was responsible for starting the tradition at MSU of trading seeds and plant species with horticulturists around the world, bringing the college’s botanical practice into the international sphere. The Beal Botanical Garden is shown here fully operational, almost forty years after its creation in 1909. The careful observance and maintenance of our campus’s plants has not lessened since the time when Beal painstakingly began his work. Bruce McCristal explains in his book The Spirit of Michigan State that MSU currently holds over 7,800 types of trees, plants, and flowers on the grounds, with—just to make an impression—over 300 varieties of crab apple trees. The landscapers of MSU work tirelessly year-round, taking down around a hundred diseased trees every year and adding up to 400 more. And in addition to this, we continue to create new gardens and walkways each year to showcase the ever on-going and incredible work of our botanists. This is a great article and I love receiving these updates. However, I’m not certain that a “crap” apple tree exists. I have looked online and cannot seem to find one, but in case it is actually a “crab” apple tree, I wanted you to know so the spelling on the site can be corrected. If, in fact, “crap” is correct, please consider this email/message a waste of your time and a display of my ignorance. We’re glad to hear you’re enjoying our blog! Thanks for pointing out the spelling error. It has been corrected. Yes, it was 1873. Thank you for pointing out that typo.